As part of a charity run by Blackston Financial Advisory Group, the National Cremation Society Fruitland Park, FL staff and other donors were able to raise over $9,000 dollars to benefit The Villages Honor Flight Network Saturday, May 21. 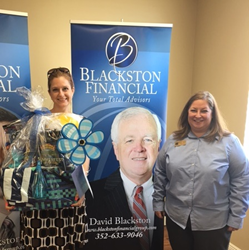 Michelle and Sara of National Cremation Society, Fruitland Park, FL delivered a “Summer” themed basket to Blackston Financial Group to be used in their Annual Honor Flight Celebration Raffle. It’s nice to celebrate veterans and what they have done for our country. “It’s nice to celebrate veterans and what they have done for our country,” said Sara McGovern, service manager for National Cremation Society Fruitland Park. Clients of the Blackston Financial Advisory Group in The Villages were able to bid on a variety of baskets to support the Honor Flight Network, a non-profit organization that transports veterans around the country for free so they can visit the memorials in Washington D.C. that commemorate their service in wars including World War II, the Korean War, and the Vietnam War. Since 2005, the Honor Flight Network has helped over 150,000 veterans visit the memorials that honor them. To do their part in raising money to enable more veterans in participating in this program, McGovern and her staff created a large Summer Picnic-themed basket with a retail value of approximately $150 to donate to the charity event. The bright blue basket included everything one would need for a classic summer picnic: cups, plates, chips, salsa, a six-pack of Summerfest beer, beach towels, sunscreen, a mister bottle, a pinwheel lawn ornament, a beach ball and more. Even the gift basket itself was a picnic basket. “We wanted people to use the whole thing,” McGovern said. The charity raised over $9,000 to provide free transportation for veterans via The Villages hub of the Honor Flight Network – the most that Blackston Financial Advisory Group had ever raised in its prior years of hosting this charity. McGovern and her team are honored to be among those who were able to support this cause. National Cremation Society Fruitland Park also helps veterans in another way. They provide specialized services to help veterans and their families plan for cremation, and assist veterans in completing paperwork to receive all the appropriate benefits the government provides. McGovern and her team help families every day schedule services with military honors, reserve spaces for interment in National Cemeteries, and receive financial reimbursements from the government. With National Cremation Society Fruitland Park, one can also preplan veteran cremation services to ensure everything is taken care of beforehand. For more information about this event or about cremation services, please contact National Cremation Society Fruitland Park directly or find another location nearby.